You hear it at most every game. Sometimes, when it becomes really volatile, you feel it, too. There is venom in the air; anger and spite thrown around as much as a ball in action. Go to a high school sporting event, in any part of the country, and it's bound to be there in some form: Team A vs. Team B, and fans vs. referees. Shoot, go to a Little League game, a Pop Warner event, a girls softball or volleyball tournament, and it's there. Fans — namely parents — take sports entirely too serious. While their intentions may initially appear noble — they want the best for their child — their approach often exceeds common sense and common decency. They become boorish. They embarrass themselves, and no one feels that shame more than their child. Too many are convinced that referees are out to get their team, and they let the referees, officials or umpires know it with words, and, sometimes, threats. "You guys are always against us!" The ripple effect is alarming. Participation numbers for referees are in decline across the country. It's easy to see why: who wants to get verbally accosted, or physically confronted for $35 or $65 a game? According to the National Association of Sports Officials, 80 percent of referees/officials walk away from their craft. And in surveys with nearly 17,500 officials, 75 percent cite "adult behavior" as the reason for their exit. These studies also reveal there are more officials over the age of 60 than 30 and under, which means the gap in age makes it difficult to cycle in new bodies. The shortage of licensed high school officials is so severe that in some parts of the country freshmen and junior varsity contests have been postponed or canceled. There have been discussion in California that if the numbers do not increase favorably, coaches will have to referee or umpire games. Imagine that chaos. Either that or it's this: No ref, no game, and the loser in all of that are the kids. Governing bodies across the country for high school sports have tried to emphasize the message of pursuing victory with honor. But it takes everyone involved to make it work. In seminars and meetings with state member schools, the plea for parental calm will continue. In that effort, National Federation of State High School Association's Karissa Niehoff has teamed with state commissioners across the land to share this message to parents: Cool it. "The time has come for everyone involved in the game to 'pump the brakes' as it relates to conduct at games," Niehoff wrote in part in statements posted on federation sites from Kentucky to California. "Make no mistake about it. Your passion is admired, and your support of the hometown team is needed. But so is your self-control. "Yelling, screaming and berating the officials humiliates your child, annoys those sitting around you, embarrasses your child's school and is the primary reason (there is) an alarming shortage of high school officials." Added Kentucky High School Athletic Association Commissioner Julian Tackett, "This is a game played by imperfect humans, coached by imperfect humans and officiated by imperfect humans. I don't know if it's the higher levels' insatiable desire for perfection through replays and announcers who think they know everything or the tone and tenor of general conversation in our country, but this cannot be allowed to continue in this level of sport and this level be maintained." It's not just a referee shortage issue at play here. It's a society issue, a cultural conflict where spectators feel they have the right to attack and berate, and that creates the domino effect. Our theme: Mute it. Observe and be thankful. Go to a Shriner's Hospital and talk to kids who would do anything to be able to stand, to walk, to run and play ball. Take that bit of perspective before unleashing on a referee. The referees are not the enemy here. They do not care who wins or loses. They care about fair play and sportsmanship. Not all parents are unruly, certainly, but it just takes a few in a crowd to crank up the volume of negativity. "Here's the thing: Hey, folks, it's a game, created for fun, an atmosphere for excitement and celebration," said Jason Harper, the founder and CEO of Character Combine, a national sports symposium that discusses such topics and holds seminars across the country. "You think about the people lashing out and it's usually parents who want to blame someone for why their kid isn't winning or struggling in that game, or they're living vicariously through their child instead of enjoying them. It's awful." Where does the venom come from? "When you look at our nation, all the vitriolic stuff, people saying brutal things to each other in politics or whatever and it just bleeds over," Harper continued. "Sports is such a powerful illustration of culture. Everyone unleashes with no filter. "The reason these officials and umpires work the games isn't for big bucks, or to run in the cold. It's because they're fans of the game, too, and their love of the game keeps them involved. I've been blown away by parents, wearing school colors, and the things coming out of their mouths. It's a sign of the times, a snapshot of our culture." The reason referees continue to blow the whistle is because they're fans of the game and it keeps them involved. I have seen it up close and personal over the 30 years I've worked for The Sacramento Bee covering regional sports. But fan behavior and a concern for referees and officials is not a new issue. I recall years ago how a father of a star player for a Sacramento-area basketball team charged after a referee at Arco Arena after a playoff game. He was furious at a late intentional foul on his son — the right call, by the way — and the father raced across the floor and into the back tunnel to confront the referee. The referee — Russell Burch — continued to officiate, and do it well. "You never get used to the abuse," Burch told me awhile back, "but we stay in it because we love the good parts of this job." Coaches play a role in all of this, too. No one disputes the effort and time a coach puts into his job, but a coach sends the wrong mixed message when he implores players to be composed amid game chaos — and then he/she is not. 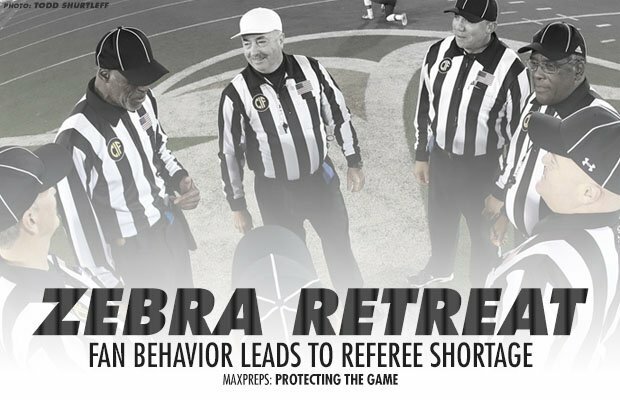 Coach behavior has also worn out referees. Just last week, I saw a coach for a boys basketball team in Northern California get into it with a referee, including this jab, "Just do your job, idiot!" The referee was doing his job. You were not, coach. And you can do your job by sitting down, remaining there, and not saying a word. 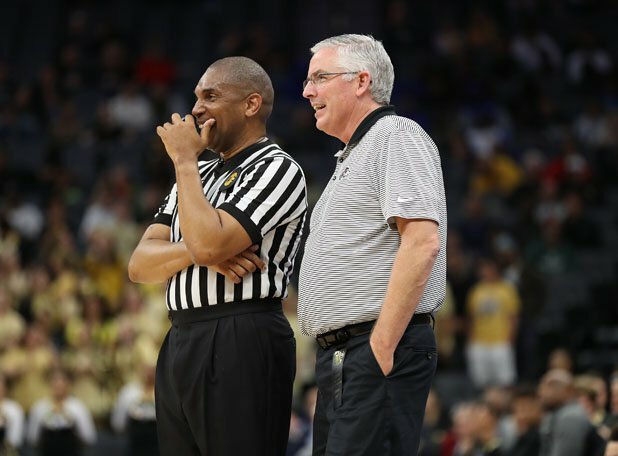 Referees invite constructive input from the head coach but do not want to hear from the mouthy assistant who is tasked by his bosses to chart rebounds and assists and not cast judgment. I saw fans of an inner-city school in Sacramento chase a referee out of a football stadium three years ago. He had to scale a fence for safety. I have observed softball and baseball high school fans throwing obscenities and, later, projectiles at umpires in the parking lot. During this academic year, there have been multiple fights in the stands and on the playing surface across the country, be it football, basketball or wrestling. In California's state capital of Sacramento, officials for wrestling are down 5 percent and baseball and softball umpires are down up to 10 percent, said Jim Jorgensen, an assigner for referees in that region. "Four years ago we had 400 officials for basketball," Jorgensen said. "We now have 290. It's a national issue, and everyone is concerned. A lot of it is sportsmanship from the players, the coaches, the fans. We've had an official bumped by a fan at a game this season, and some have been followed out of the lobby. That's not right." At the end of the day — and during the games — referees are just people too. So why officiate and umpire? "It helps people stay in the game, to stay in shape, to be a part of it, and the camaraderie and friendships are forever," Jorgensen said. "But we have to figure this out." Even Mike Pereira, the retired NFL referee who remains involved in the game as the FOX Sports rules analyst, has taken notice. "We have to change the mindset of coaches and fans in all of this," Pereira said. "This is the only profession where everyone hates you before you even start your job, and then it gets worse. Players learn from hearing their parents yell at referees, so they lose it, too, and that's not OK."
Pereira said he wants to be part of the solution to help. Two years ago, he initiated a "Battlefields2Ballfields" national program that encourages military veterans to become officials. 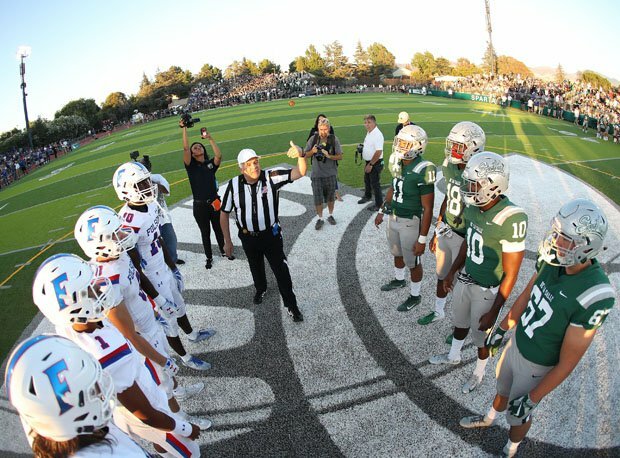 And through the assistance of the Northern California Officials Association (NCOA), Pereira has launched "Officiate Sacramento" to raise the numbers of high school officials in that region, hoping it becomes a national trend. Pereira said the goal is to hire referees, train them, mentor them and then hope they continue the cycle. "It's not right for people to throw a brick through the window of a referee," he said. "We have to get everyone on the same page and remember that these are games, for fun."